Whether you're charging through doors to clear a house, or creeping around corners in urban terrain, the CYMA Tri-Burst Tactical Shotgun is the perfect weapon to have at your side. This spring shotgun has the power and accuracy to keep up with some of the best gas shotguns on the market. The beauty of a spring actuated weapon system is that you will never run out of propellant and your batteries will never die since you don't even need them. Not only is this gun reliable, the polymer furniture, metal outer barrel, and metal folding stock add a high level of durability and make this spring shotgun feel very realistic in your hands. The forestock of this airsoft shotgun has a ribbed texture, which makes cycling the action very easy even in harsh conditions or with gloves on. The polymer pistol grip is textured as well to ensure a reliable grip and increase positive weapon control. Tactical sling swivels have been included on the toe of the pistol grip as well as on the magazine cap, allowing you to attach your favorite sling without the need for adapters or additional parts of any kind. Attaching a sling makes quick work of transitioning between the CYMA Tri-Burst Shotgun and a sidearm, all without losing positive control of your weapon. 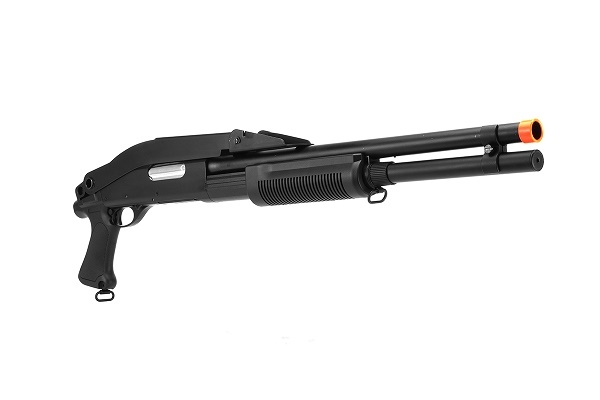 The most prominent physical feature of this spring shotgun is the metal folding stock. This stock can be folded to lay flush against the body of the weapon, so it is out of the way when you need a more compact setup for clearing rooms, assaulting staircases, or performing other CQB maneuvers in tight spaces. When the terrain opens up, you can deploy the stock with the press of a button to further stabilize your shooting platform and improve your accuracy. This shotgun uses 30-round shell type magazines instead of an AR/M4 type mag. The standard package only includes one shell, so we recommend picking up a few extra shells, so you always have some shells in reserve. - Folding stock for easy transitioning between firing from the shoulder and firing from the hip.